Amid widespread apathy and corruption, Georgia’s democracy faces all too familiar obstacles. Supporters of the opposition United National Movement (UNM) rally in Tbilisi on 5 October. (c) Shakh Aivazov / AP / Press Association Images. All rights reserved.Georgia has just held parliamentary elections. It was a long campaign — four months of incessant political advertising and argument. This was welcomed by outside observers, a demonstration of the country’s vibrant democracy. But it may also have explained, the low turnout of 51.63%. 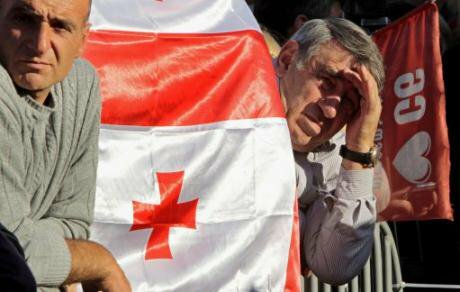 Georgians were exhausted, confused and disillusioned. The campaign, despite its longevity and colourful political spectrum, was uninformative, characterised by vitriol and warnings of future doom, should you vote for the other party. It underlined, like the US election campaign, the growing norm of oligarchic elections dominated by the concerns of “enlightened elites” and the professional obfuscations of PR managers. With 48.67% of the total vote, Georgian Dream-Democratic Georgia received 44 of the 77 parliamentary seats allocated by proportional representation; the major opposition party, the United National Movement (UNM), received 27.11% (27 seats), and the Alliance of Patriots of Georgia-United Opposition, (APG), a strange concoction of six mini-parties, 5.01% (six seats). To date (18 October), Georgian Dream has won 23 of the majoritarian (first past the post) seats in Georgia’s 73 electoral districts. The remaining seats will go to a second round at the end of October. With 67 seats already in the bag, and the likelihood of capturing the majority of the remainder, Georgian Dream will have the ability to introduce constitutional changes (which require 113 votes). When Ian Kelley, the US ambassador to Georgia, wished for an “election campaign… as good in the United States as it is in Georgia,” he reminded us that mature democracies have serious electoral flaws too. US elections are strongly influenced by moneyed elites, potent lobbies, and politicised courts (such as the US Supreme Court in 2000). Powerful interest groups have intensified the country’s unequal electoral battlefield, and contributed to distrust in the US political system. This should give us pause — the problem is not just about “young democracies” like Georgia which allegedly need external monitoring, but about mature democracies that refuse to be measured by their own standards. 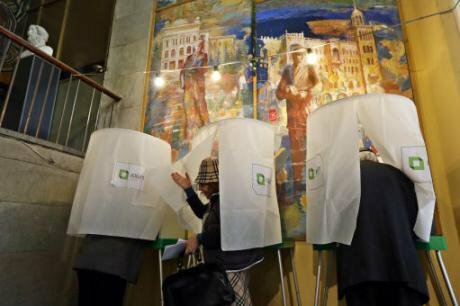 The Organisation for Security and Cooperation in Europe (OSCE) would be unlikely to give US elections a positive assessment. It is time for Georgia to be taken out of the confines of the “post-Soviet space”, which leads to an implicit assumption of electoral inferiority and an expectation of failure. Georgia’s electoral process should be judged alongside democracies elsewhere, which are also characterised by dramatically uneven resources, uninformed electorates, media manipulations, and polarised parties. To paraphrase John McCain, “we are all Georgians” now, trying to construct democratic electoral systems in the context of increasingly unequal societies, where political elites deploy ever more sophisticated electoral technologies. In this sense, it’s not just Georgia’s problem – it’s our problem too. Georgian parties exemplify an issue faced by many modern democracies. They remain like the floating island of Jonathan Swift’s Laputa, suspended above the electorate, controlled by squabbling politicians, and deaf to the people’s needs. The political fireworks on Georgian TV couldn’t hide the emptiness of this campaign and the failure of Georgia’s parties to represent popular concerns. The political leaders were, perhaps, as nonplussed as the voters, which is why issues like mass unemployment, poverty, housing, the environment (World Health Organisation figures in 2012 showed the capital Tbilisi had the world’s highest per capita death rate from air pollution) and future economic strategy were hardly mentioned. The popular verdict was underwhelming. Georgian Dream, the winner, received the endorsement of just one quarter of Georgia’s total electorate. UNM the main opposition party, received the approval of between one seventh and one eighth. The OSCE gave its usual cool assessment. The election was “competitive, well-administered and fundamental freedoms were generally respected.” This is fine – as far as it goes. Such responses confirm the limited technical goals the OSCE sets itself at election times – a snapshot of electoral rule playing. But this was an election which revealed structures and norms which represent major obstacles to an accountable and democratic political culture.. The two major parties represent irreconcilable political styles and visions. The iconoclastic UNM remains a vigorous supporter of more reform as quickly as possible, while Georgian Dream projects incremental change and stability. Both parties pulsate with hatred for one another; personal insults have laid the groundwork for conflict in parliament, characterised by boycotts, walkouts and absent quorums. A woman leaves a polling booth in Tbilisi on the eve of parliamentary elections. (c) Sergei Grits / PA / Press Association Images. All rights reserved.The venom exchanged by two dominant figures in Georgian politics is a clear example. Bidzina Ivanishvili, the power behind Georgian Dream and UNM’s former leader Mikheil Saakashvili regularly accuse one another of criminal conspiracies — and it’s clear that there’s no change of heart at the top. The conversion from a super-presidential to a semi-parliamentary system in 2010 helped diminish the institutional stimulus for charismatic leadership, but it has only moved the Wizards of Oz back behind the curtain, a depressing result of a well-intentioned reform. The detachment of these two politically unaccountable figures from their parties and the political system more generally would be a great plus for Georgia’s democratic growth. After all, the informal exercise of power by the unelected and the influential limits democratic rule. It may be, as some political commentators suggest, that Georgian voters no longer seek political saviours to solve their problems, but Georgia’s elites, it seems, still need them. Both are a serious obstacle to the development of political representatives and parties responsive to electoral demands from below. Georgian democracy should not be famed, as Western commentators often do, as something different, a little exotic unexpected, and attached to the world rather than part of it. The adoption of the globally fashionable neo-liberal model, for example, transformed Georgia’s social structures and reshaped the country’s economic and political norms. This has had a dramatic effect on how Georgians view the state and how they vote. But Georgia, like all countries, has its specifics. In evaluating Georgian elections (and the workings of its democracy more generally), we cannot omit the role of national minorities, the influence of the church, the evolution of its constitution, or the alternative political cultures of the electorate. Since 1990 - the first relatively free election since 1919 - Georgia has had eight parliaments. This October makes it nine. Half of these (in 1991, 2003, and 2008) ended in a coup, a “revolution” or mass protest, and two (2004 and 2012) ended in a democratic change of power. In terms of Georgia’s own electoral past, the 2016 elections (conducted for the first time without a crisis hovering overhead) were stable and well-ordered. Two reforms in 2015 evened out disparities between electoral districts and increased the threshold for election in majoritarian districts from 30% to 50%. This improved electoral equality. The elections of 2012 brought about a broad coalition under the umbrella of Georgian Dream, creating a parliament containing multiple interests and multiple parties. No single party had the ability to change the constitution or override the president’s veto. Two parties, the Republicans and Our Georgia-Free Democrats (OGFD), were strong supporters of constitutionalism, the rule of law, and civil rights. Symbols of another new Georgia, at the presidential palace in Tbilisi. Photo: Maxim Edwards.The outcome in 2016 is quite different, generated by low turnout, fractured parties and blocs, and a polarised political atmosphere. Parliament will have three parties — the eclectic Georgian Dream, the alienated UNM, and the nationalist (and even more eclectic) Alliance of Georgian Patriots. As mentioned earlier, it is also very likely that Georgian Dream will be able to rewrite the country’s constitution. This is a return to the pre-2012 pattern which has plagued Georgian politics for almost 25 years. One-party dominance is not always bad, but we have to trust the party to observe the rules of parliamentary democracy, both inside and outside the chamber. I am not sure that we can. An effective opposition, as Disraeli noted, “offers vengeance to the discontented, and distinction to the ambitious; and employs the energies of aspiring spirits, who otherwise may prove traitors in a division or assassins in a debate.” The history of one-party dominance in Georgia would support every one of these arguments. In the Georgian context – and this is a significant difference with most (but not all) European democracies – a marginalised opposition has little opportunity to influence executive power by other means. Georgian civil society is relatively weak, the judiciary is prone to side with the executive, and business groups ally with their most powerful political patron: the government. Recent political history supports the proposition that one-party preeminence in Georgia’s parliament is deadly, not only to a working democracy, but to the party itself. Cumulative victories over parliamentary and societal oppositions are in the end defeats – to the legitimacy of the party, to its connections with society, and to its ability to adapt. All Georgia’s dominant parties in power have fallen in disgrace, covered in the calumny of corruption. With a billionaire patronising an even more dominant Georgian Dream, the economic temptations will now be even greater. The history of modern Georgian governments is characterised by the concentration of executive power. That is inevitable in all modern democracies, but in Georgia, the convergence of public and private spheres within state structures, the exercise of direct and indirect control on the judiciary through appointments and political pressure, and the undermining of regional autonomy by centrally appointed or manipulated governors – or by ministers with financial control – has been pernicious. Georgia’s political and social institutions, including the media and civil society, do not have the strength to contain the confluence of money with government and powerful business networks. 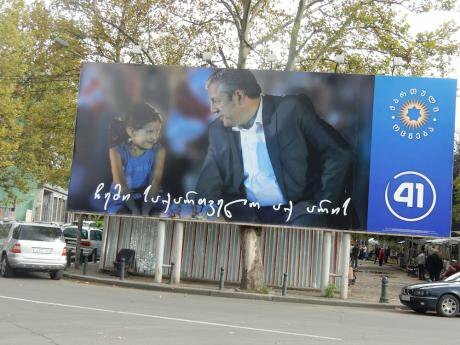 “Our Georgia is here!” reads this Georgian Dream campaign billboard, depicting prime minister Giorgi Kvirikashvili. CC: Shuvaev / Wikimedia Commons. Some rights reserved.Between 2012 and 2016, Georgian Dream broke with this tradition. It benefited from a strong multi-party parliament, a weakened presidency, and the cessation of political pressures to restore breakaway territories (by 2008, Abkhazia and South Ossetia were essentially under Russian political control). Georgian Dream’s raison d’être was a program designed to uproot Saakashvili’s authoritarianism. This liberated the party from the traditional executive focus on central control. But now the question arises: was this an aberration? Can Georgian Dream, unchecked by a coalition, by presidential veto, or by its constitutionally minded Republican Party allies resist the temptation to accumulate power, and with it, wealth? Can it cooperate with the National Movement (if Saakashvili no longer leads the pack), and encourage the UNM to become a constructive opposition? Can the new faces in the UNM see the benefit of cooperation? If Georgia’s ruling party can do these things, then it may avoid the likely scenario of a frustrated electorate, finding no improvement in its economic well being, searching for a traditional and well-proven Georgian expression of power in the streets. It would be a Georgia that we have seen again and again – a widening chasm between leaders and led that leads in the end to a popular explosion.